DIN invites industry and defence stakeholders to help identify important defence problems. We are seeking problem statements with high potential to satisfy defence capability needs. Successful proposals will be funded up to $200,000 by the DIN Pilot Project grant scheme. The Defence Innovation Network, an association of seven leading NSW universities, has received support from the NSW Office of the Chief Scientist and Engineer and DST to fund collaborative research projects with direct industry and defence focus. 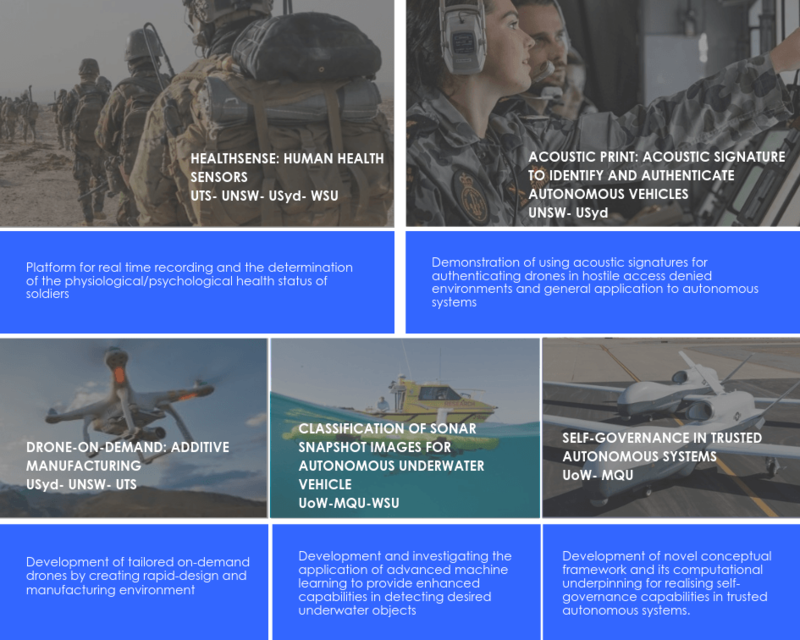 The intent of our Pilot Project grant scheme is to conduct a rapid feasibility study on new ideas for Defence and develop these ideas into concept or technology that can attract further investment from the government or industry. DIN is inviting industry and defence stakeholders to help identify important defence problems. We are seeking problem statements with high potential to satisfy defence capability needs. We will then invite you to pitch your problem statement at our up-coming Sandpit Workshops attended by academics, Defence stakeholders and industry. Problem statements can be submitted via a simple on-line form until 30th April 2019. Analysis of cognitive load (RAAF). Unanswered questions subserving this goal include the efficacy of different training methods to improve situational awareness under high cognitive load and the relative value of various personnel selection procedures designed to identify the most capable individuals. Autonomous analyst for researching and developing an intelligent decision support system capability to support Force Design. What would the Defence network look like if it were designed to facilitate information superiority and secondly how could CIO Group evolve the existing networks from the current to future state without compromising information assurance along the journey? How can decision making be supported when facing changing circumstances in modern integrated warfare and in such a way that optimum combination of the complex array of systems available is employed? Each of the three military environments (Maritime, Land and Air) has been considered and the problem statement seeks to generically capture the requirements of mission support for all three. How can ADF measure real-time and cumulative effects of stress and present that data in order to enable detection and intervention of high risk individuals? What emerging technologies are there that could assist a reconnaissance patrol in detecting and tagging mines allowing rapid passage through denied terrain? What advancements in technology can be applied to create novel PNT technologies to future proof ADF capability? How can Natural Language Processing or other methods be utilised to transcribe radio transmissions in real time, creating a searchable database?